ARLINGTON, VA; April 10, 2014 -- PBS announced today a summer schedule of programming spanning generations and genres. From examinations of our nation’s history to our connections to the animal kingdom, and escapes to Britain’s courtrooms and countryside, PBS offers diverse series and specials for all viewers. Returning favorites this summer include the second season of “Endeavour” on MASTERPIECE MYSTERY!, perennial Independence Day celebration A CAPITOL FOURTH and engrossing documentaries from POV, including the season premiere film “When I Walk.” New specials, including AMERICAN EXPERIENCE “Freedom Summer” and a documentary on the infamous AL CAPONE (w.t.) bring the past to life. British dramas and comedies continue to hold court Sunday nights on PBS. David Tennant opens the MASTERPIECE MYSTERY! season with “The Escape Artist” on June 15. A double-dose of Derek Jacobi — with the Season 2 premiere of the dramedy LAST TANGO IN HALIFAX and the new comedy VICIOUS, also starring Ian McKellen — joins the second season of MASTERPIECE MYSTERY! “Endeavour” to create a winning lineup beginning on Sunday, June 29. PBS stays committed to presenting timely programming with films that look at history, both distant and up-to-the-minute. Fifty years later, AMERICAN EXPERIENCE’s “Freedom Summer,” premiering on Tuesday, June 24, looks back at the violent summer of 1964 in Mississippi, when over 700 student volunteers joined civil rights organizers and local citizens to shatter the foundations of white supremacy in one of the nation’s most segregated states. The Monday, June 16 premiere of the documentary AMERICAN PHAROAH follows the Egyptian National Football Team, its American coach Bob Bradley, and its quest to qualify for the 2014 World Cup in Brazil. On Tuesday, June 17, Emmy-winning actress Patricia Clarkson narrates a behind-the-scenes program of Ken Burns’s upcoming family epic, THE ROOSEVELTS: AN INTIMATE HISTORY. SECRETS OF UNDERGROUND LONDON premieres Sunday, June 22, following its popular predecessors with a look into one of England’s most storied landmarks. The long-running HISTORY DETECTIVES returns Tuesdays in July in a new format called HISTORY DETECTIVES SPECIAL INVESTIGATIONS: hour-long episodes that look in-depth at major international “cold cases.” Also returning is SECRETS OF THE DEAD on Wednesdays, with enthralling new episodes including “The Other Mona Lisa,” a look at the analysis of a rumored secret Leonardo da Vinci painting that depicts a younger version of his iconic model. On Friday, August 8, for the first time on film, THE ROYAL PAINTBOX gives viewers an extremely rare glimpse at artwork produced by British royal family members over the centuries. In addition, the PBS Online Film Festival returns for the third year beginning Monday, June 16 through Thursday, July 31. The Festival will feature more than 25 short films from INDEPENDENT LENS, POV, and will include works from, and collaborations with diverse public television producers including, Center for Asian American Media, Latino Public Broadcasting (LPB), Vision Maker Media, National Black Programming Consortium (NPBC) and Pacific Islanders in Communications (PIC). Following the continued success of Sunday Night Dramas in the winter/spring season, PBS carries the trend this summer with a slate of dramatic programming. David Tennant (“Doctor Who”) stars as a brilliant defense lawyer with a storybook family and a potent nickname, “The Escape Artist,” for his ability to spring the obviously guilty. Then he gets a trial that changes his life forever. This gripping legal thriller costars Sophie Okonedo (Hotel Rwanda) as the hero’s rival, along with a courtroom full of ambitious attorneys and one very unnerving defendant. On the surface, London is a buzzing, modern metropolis — but underneath lies a secret, hidden world, all but forgotten by the millions of people above. This program uncovers 2,000 years of subterranean history: a world of ancient caves and perfectly preserved Roman remains; mysterious rivers and gruesome plague pits; impenetrable vaults and top-secret bunkers. 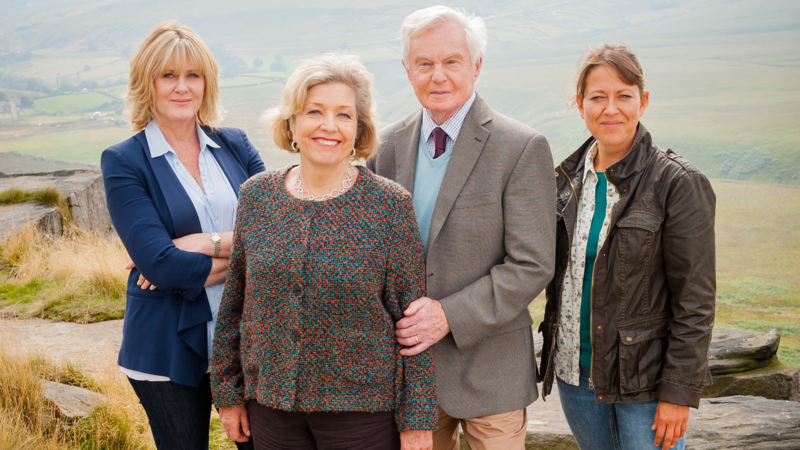 The BAFTA-winning comedy drama about romance and second chances returns as the reunited childhood sweethearts Celia (Anne Reid) and Alan (Derek Jacobi) plan a life together. As secrets from the past come tumbling out and family members adjust to changing relationships, can Alan and Celia find the long-awaited happiness they deserve? Before “Inspector Morse,” there was the rookie Constable Morse, fed up with police work and ready to nip his career in the bud by handing in his resignation. That is, until a murder turned up that only he could solve. Shaun Evans returns for a second season as young Endeavour Morse, before his signature red Jaguar but with his deductive powers already running in high gear. Partners Freddie (Ian McKellen) and Stuart (Derek Jacobi), who have lived together in a small central London flat for nearly 50 years, are always at each other’s throats, making snide remarks aimed at the other’s age, appearance and flaws. However, underneath their vicious fighting, they share a deep love. Freddie and Stuart are often joined by feisty best friend Violet (Frances de la Tour, Harry Potter and the Deathly Hallows) and Ash (Iwan Rheon, “Game of Thrones”), their young, upstairs neighbor. David Suchet returns in his signature role as suave Belgian super-sleuth Hercule Poirot in two new mysteries, “The Big Four” and “Dead Man’s Folly,” based on the novels by Agatha Christie. Whether he’s on holiday abroad, taking a countryside break or simply going about his business, Poirot exercises his “little grey cells” by helping police investigate crimes and murders — whether they ask for his help or not. In this stylish and compelling new medical drama set in London in 1961, Jack Davenport (“Smash,” Pirates of the Caribbean) stars as a brilliant surgeon who believes he can make a difference in women’s lives. Mondays this summer see a new collection of vintage finds from ANTIQUES ROADSHOW Vintage episodes. Independent films continue to shine as POV premieres its 27th season, and in honor of the World Cup in Rio, specials join the June lineup to give insight into the people and places of the games’ location. Michael Palin visits Brazil, traveling from the lost world of Amazonia to the buzzing metropolis of Rio de Janeiro, meeting the people and visiting the places that shape this South American nation. Join Palin as he visits vaqueros, learns to drum and cook Bahian-style and studies capoeira moves. Travel with Palin on rivers through the very heart of Amazonia. Head to Rio to learn about the vibrant city that will host the next Olympics and World Cup. See what Brazil has to offer the world as it takes its place as a potential new superpower. Experts from auction houses and independent dealers offer free appraisals of antiques and collectibles, revealing the truth about heirlooms, yard sale bargains and neglected items salvaged from attics and basements. Mark L. Walberg hosts. This summer, special Vintage episodes revisit memorable appraisals from past visits and update their values. This documentary about the Egyptian National Football Team, their American coach, Bob Bradley, and the team’s quest to qualify for the 2014 World Cup in Brazil follows the team on and off the pitch, and offers a unique window into events unfolding in Egypt following the historic revolution. Bradley arrived in Cairo in late 2011 and found a country and a team in chaos. The rebuilding of the team offers a powerful metaphor for the rebuilding of Egypt and the country’s journey toward democracy. The award-winning POV (a cinema term for “point of view”) series is the longest-running showcase on television to feature the work of America’s best contemporary-issue independent filmmakers. The 27th season premieres on Monday, June 23 with “When I Walk,” a life-affirming documentary that chronicles filmmaker Jason DaSilva’s struggles with multiple sclerosis. Jason DaSilva was 25 and a rising filmmaker when he was diagnosed with multiple sclerosis and inspired to film this forthright—and surprisingly uplifting—look at his new life. He searches for a cure, yet a different miracle comes his way. Meet Grace Lee Boggs, a Chinese-American philosopher in Detroit who has been waging a revolution for 75 years. Her story unfurls to portray an evolving city—and to examine the power of ideas and imagination to propel change. Election time in New Orleans: Corruption. Racism. Dancing in the streets. And one in-your-face politician trying to get re-elected. Let the good times roll. At 15, Russian ballroom dancer Egor leaves everyone and everything he knows for a chance to team up with 14-year-old Mie, one of Denmark’s most promising young performers. Will his choice be worth the sacrifices he must make? After an earthquake levels Beichuan, China, a modern replica rises with astounding speed, but while a city can be rebuilt quickly, reconstructing a community’s heart and soul is a long, emotional journey for the survivors. Filmmaker Mahdi Fleifel revisits his former home to share a passionate, bittersweet account of one family’s multi-generational experience living as permanent refugees in southern Lebanon. Big Men, executive produced by Brad Pitt, goes to Ghana to provide an unprecedented look at the global deal-making and dark underside of oil development—a contest for money and power that is reshaping the world. Tuesday nights focus on discovery, revealing stories of American icons, digging into wonders of the ancient world and re-opening historical cold cases. Sample the upcoming Ken Burns documentary THE ROOSEVELTS: AN INTIMATE HISTORY in this exclusive PBS Preview, hosted by Patricia Clarkson. Follow the camera crews into the grand estates and intimate cottages of the Roosevelts. Visit the studio as Burns records the voices of the stars who read the diaries, letters and contemporary accounts of this noteworthy family. And see clips from the monumental series that traces more than a century of life with this influential family. In the hot and deadly summer of 1964, over 700 student volunteers joined organizers and local African Americans in Mississippi in an effort to shatter the foundations of white supremacy in one of the nation’s most segregated states. Together they canvassed for voter registration, created Freedom Schools and established the Mississippi Freedom Democratic Party to challenge the all-white state Democratic Party at the national convention. With cutting-edge technology that can “read” buildings, ruins and landscapes from ancient worlds, this series reveals physical and forensic history, allowing viewers to reach out and touch the past. In a new format of the long-running HISTORY DETECTIVES, each hour-long episode will ask probing questions behind a single iconic mystery from our past, focusing on major controversial “cold cases” within and outside the United States. Starring Wes Cowan, Tukufu Zuberi and Kaiama Glover. TIME TEAM AMERICA plunges the viewer into the grime and glory of real-life archaeology: epiphany and exhaustion, discovery and disappointment. Through the dirt, sweat, dust and rain, archeologists explore the mysteries of the past. Part adventure, part hard science, part reality show, TIME TEAM AMERICA applies the latest technology and the team’s collective expertise to solving the riddles of the past — against a ticking clock. Wednesdays feature scientific journeys that deepen our understanding of the social aspects of the animal kingdom, with new series joining NOVA and NATURE for a summer of new wildlife programs, and new SECRETS OF THE DEAD mysteries examining the Mona Lisa and others. In September 2012, headline news shook the art world. A secret Leonardo da Vinci painting had been uncovered, a portrait of a younger Mona Lisa that predated the Louvre masterpiece. Now, an elite group of experts has gained exclusive access to analyze the painting. Applying high-precision, scientific techniques, they will aim to verify the painting’s date, decipher hidden mathematical codes within it and unravel the clues that point to Leonardo’s genuine hand. Hear extraordinary stories of the bonds between humans and their animal companions. The intense bond between Aisha, a baby elephant orphan, and Daphne Sheldrick, the woman who became her human foster parent, reaches a crisis point when Daphne leaves Aisha with a babysitter for a few days to attend her daughter’s wedding. Aisha refuses to eat, leading to her death. Heartbroken, Daphne uses the lessons learned from Aisha’s short life to help her save more than 150 orphans over the next 40 years. Witness the true story of Andre, a two-day-old wild harbor seal who, in 1961, was rescued from certain death by Harry Goodridge, an arborist from Rockport, Maine. Over the next 25 years, Andre and Harry established a friendship that brought Andre into the world of humans without Andre’s ever having to sacrifice his wildness. Comparative anatomist Professor Joy Reidenberg and vet Mark Evans explore the life and death struggles of earth’s greatest species as they attempt to reproduce in some of the most hostile environments on earth. Veterinary scientist Mark Evans applies his passion for animals and gadgetry to tackle the conflicts between humans and wild animals. Arts programming remains center stage on PBS Friday nights, highlighting performances, characters and icons each week. Tanaquil Le Clercq, known as “Tanny,” was the inspiration and then the wife of choreographic genius George Balanchine. She also sparked the creative imagination and adoration of Jerome Robbins. In 1954, at the height of her fame, she was struck down by polio. Nancy Buirski’s film features interviews with those who knew her, including Jacques D’Amboise and Arthur Mitchel, and finds a tone to match Tanny’s exquisite dancing and long, lovely physique, well represented in photos, home movies and kinescopes. An exciting young cast stars in Franco Zeffirelli's lavish production of Giacomo Puccini's popular work, the most-performed opera in Met history. Led by Italian conductor Stefano Ranzani , this production features Italian star tenor Vittorio Grigolo as the passionate poet Rodolfo, and Latvian soprano Kristine Opolais as his fragile lover, Mimi. Hosted by mezzo-soprano Joyce DiDonato. Two-time Emmy Award-winner Tom Bergeron (“Dancing With the Stars”) returns to the West Lawn of the U.S. Capitol to host the 34th annual broadcast of the country’s national Independence Day celebration. Bergeron will lead an all-star cast in a patriotic evening of unrivaled musical performances by our nation’s biggest stars, with the National Symphony Orchestra under the direction of top pops conductor Jack Everly. With 20 cameras positioned around the city, viewers are front and center for the greatest display of fireworks anywhere in the nation. In commemoration of the upcoming Giuseppe Verdi bicentennial in 2013, Music Director Gustavo Dudamel and the Los Angeles Philharmonic perform a thrilling concert of Verdi’s towering Requiem Mass at the Hollywood Bowl. The concert presentation features soloists Julianna Di Giacomo (soprano), Michelle DeYoung (mezzo-soprano), Vittorio Grigolo (tenor) and Ildebrando D’Arcangelo (bass). For the first time on film, His Royal Highness the Prince of Wales reveals an extraordinary treasure trove of rarely seen art by members of the royal family, exploring a colorful palette of intimate family memory and observation. Shot in the spectacular landscapes of Balmoral, Highgrove, Windsor Castle, Frogmore and Osborne House, the program features art by members of the royal family down the centuries, including some of the Prince of Wales’ own watercolors. View more than six decades of 20th century America through the prism of Lange’s life and lens. Known for her powerful images from the Great Depression, her haunting “Migrant Mother” remains emblematic of that period. As young America matured into a world power, Lange continued to bear witness, bringing subjects alive, transmitting raw emotions and capturing the human condition. This film is made by Dyanna Taylor, Lange’s granddaughter, who began her artistic vision, literally, at Lange’s feet.